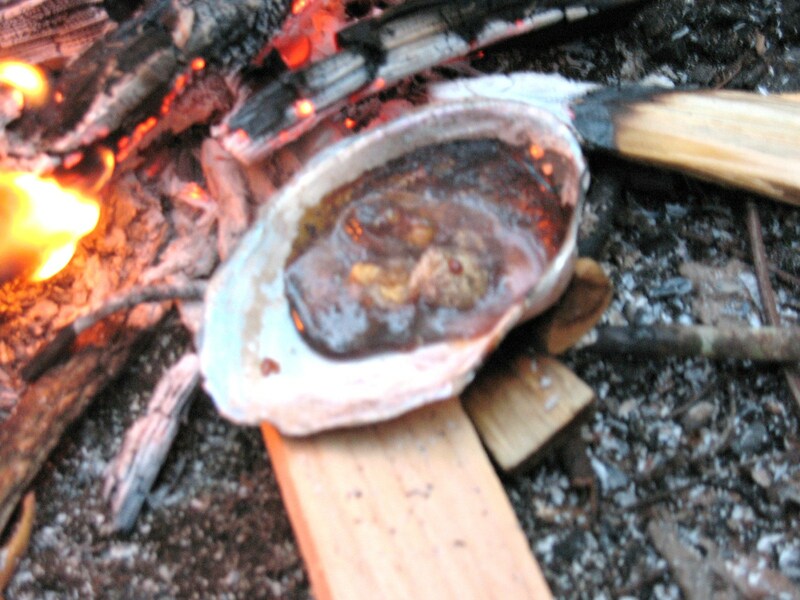 Pine pitch glue is the Super Glue of wilderness survival. It can be used to help secure arrowheads, spear points, or knife blades, it can be used to water-proof the inside of a basket, it can be used to seal the seams of a bark container, or to water-proof the seams of a birch bark canoe. 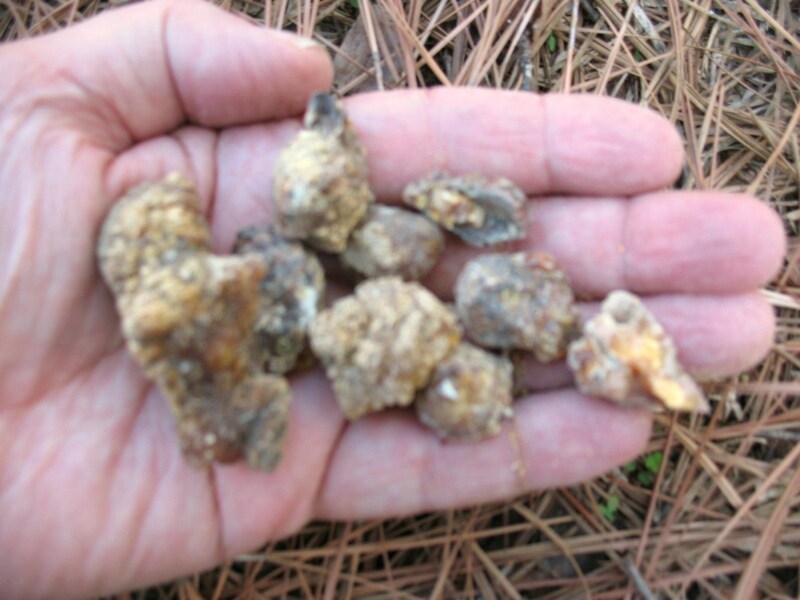 Just about any walk in the woods can provide you with pine sap. Keep your eyes open for a pine tree that has had the bark damaged. 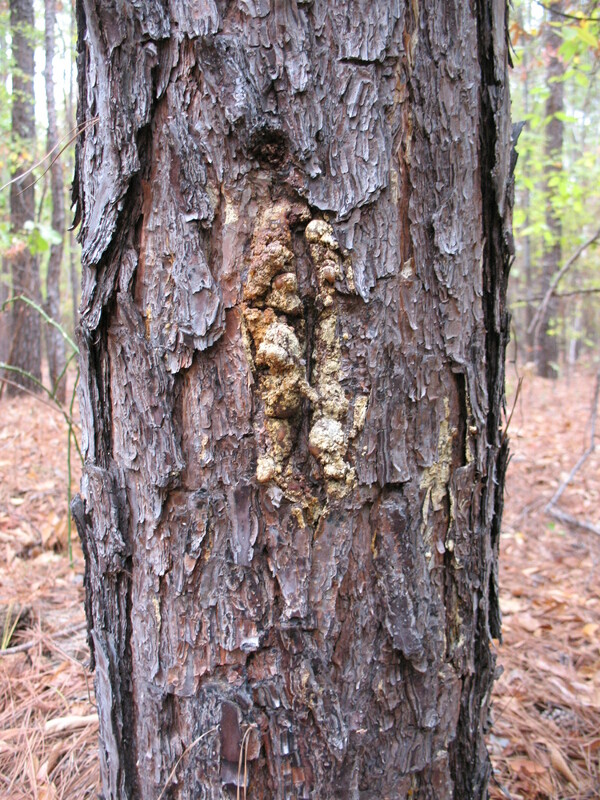 When a pine tree is injured it oozes pine sap to seal the wound. This pine sap will dry into a hard, amber colored substance that can be easily picked off of the tree. Pictured below: Pine sap on the tree and in my hand. 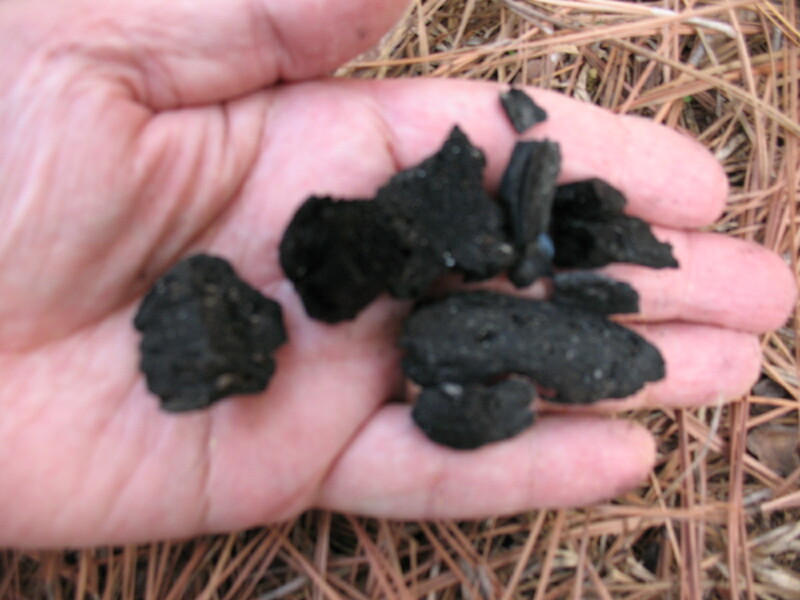 Softwood charcoal can be gathered from a campfire where pine has been burned. The charcoal needs to be ground into a fine powder before you use it, so take your two rocks and using them like a mano and metate grind down the charcoal. 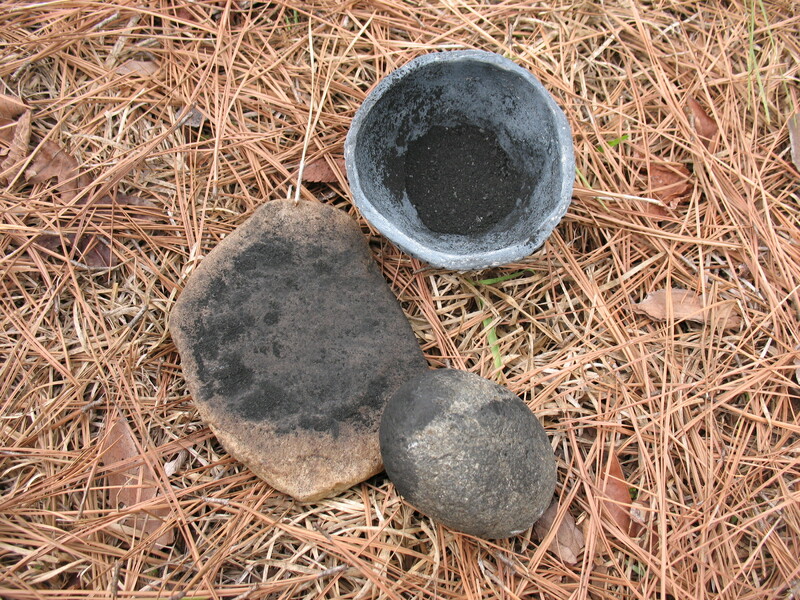 Pictured below: top, softwood charcoal; middle, grinding the charcoal into powder; bottom, charcoal powder in a small clay pot. To turn the two ingredients in to pitch glue, place the chunks of dried pine sap in your warming pot and place over very low heat. 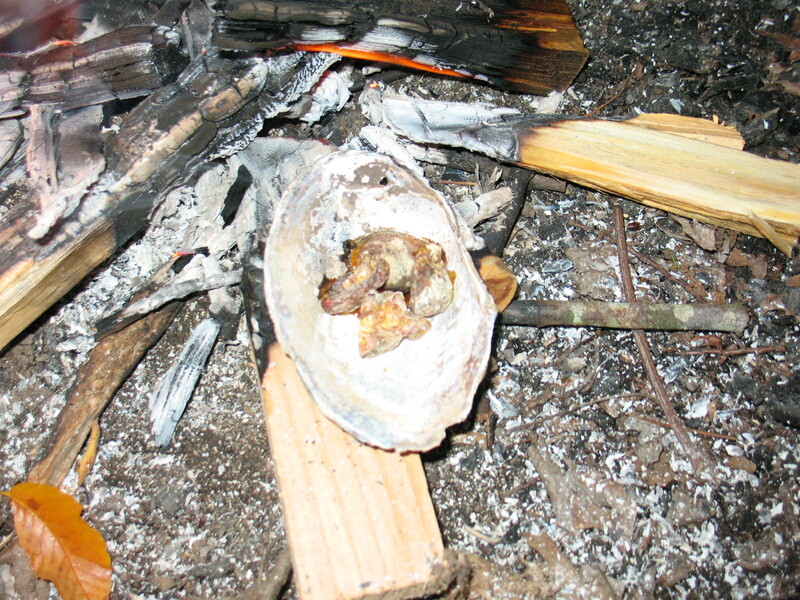 Pine sap is very flammable so if you do this over a campfire you should let the fire burn down to coals first and then set the pot near the fire rather than directly on it. If you don’t have a pot, you can use a stone with a slight depression in it, or you can use a mussel shell as I have in the pictures below. As the sap heats it will begin to melt. When all of the sap has been reduced to a liquid, pour in the ground charcoal. 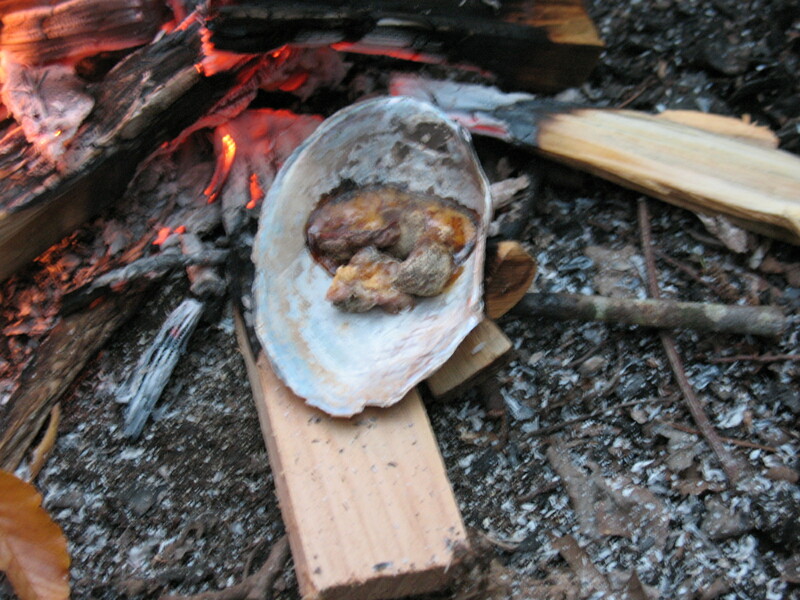 You will have to experiment on the proportions but five parts sap to one part charcoal is a good place to start. 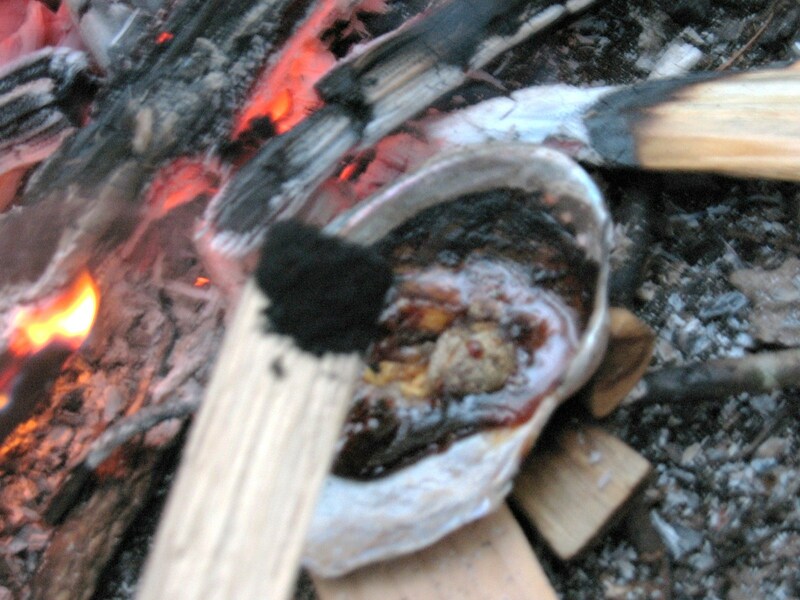 Take your stick and stir the mixture until the charcoal is evenly distributed throughout the sap. 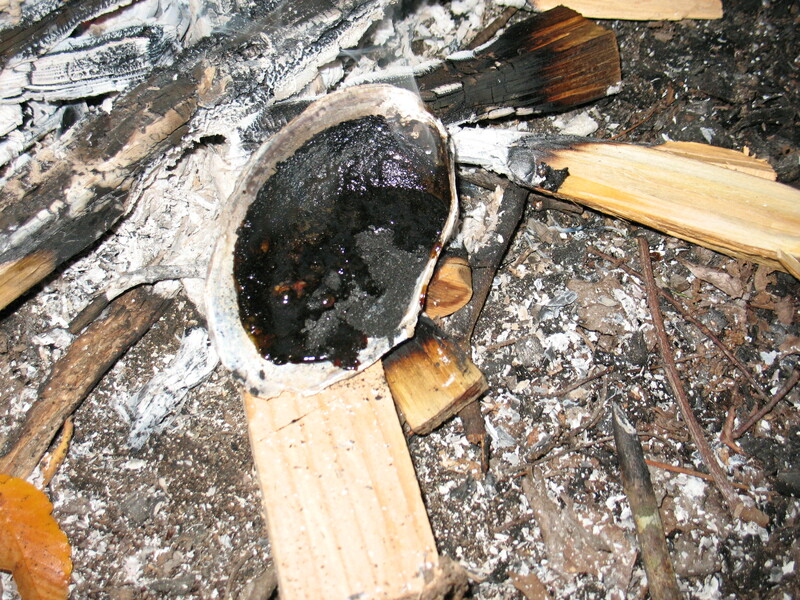 Pictured below: top, adding charcoal powder to the melted pine sap; bottom, sap and charcoal ready to stir together. You can now remove the pot from the fire and let your pitch cool. If you got the proportions right, the pitch should still be a little soft and elastic after it cools. 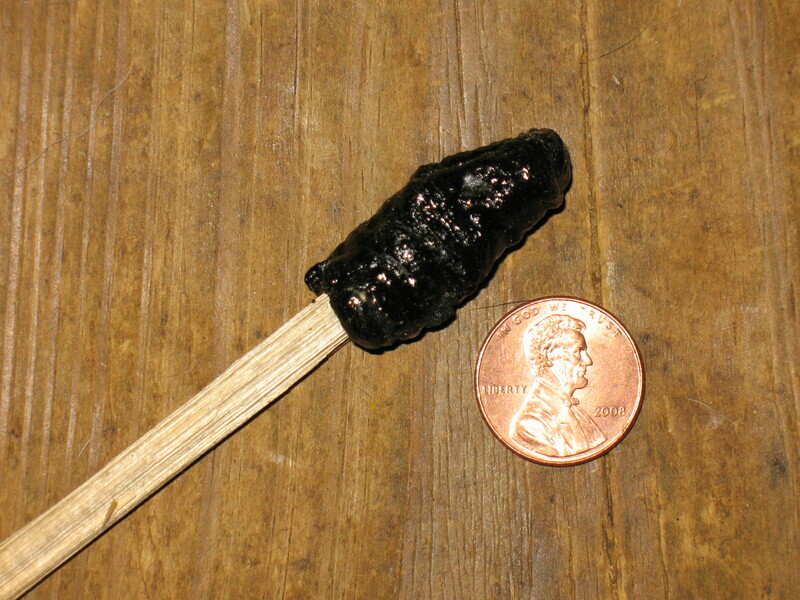 If you like, you can swirl a small stick in the warm pitch and build up a little glob on the end. These glue sticks are a convenient way to store and transport pitch. Pictured below: pine pitch glue stick. To use the pitch you can re-warm it slightly to soften it. 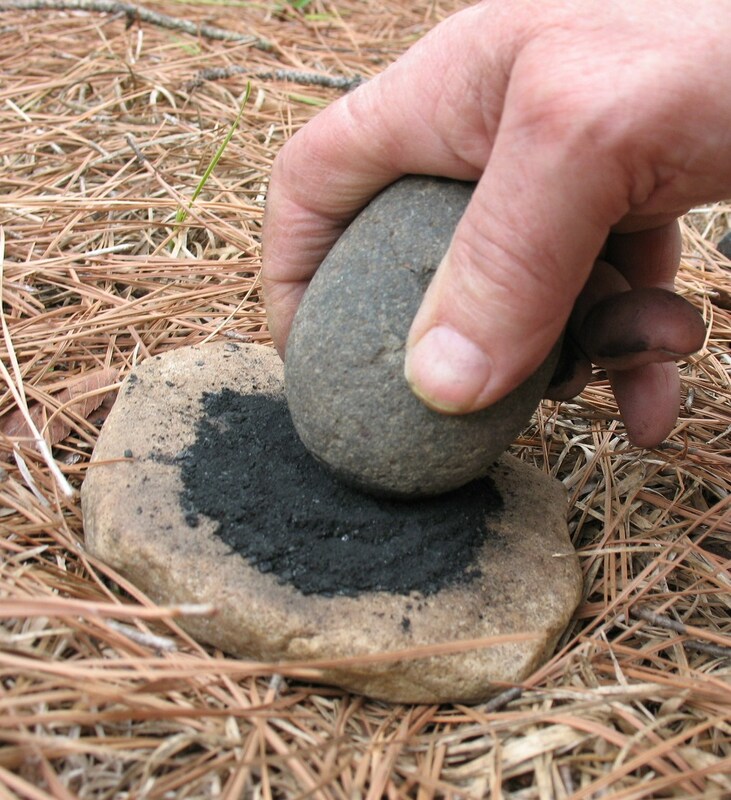 This can be done by pinching off a small piece of pitch and placing it on a rock beside your campfire. I have used pine pitch for many things but mostly to put on wounds and stop bleeding. I am curious if the charcoal mixture like this would make it more effective or not? Any ideas? I am putting this one in my skills to remember list as I think this could be a very useful tool for many reasons. Charcoal is, of course, a great filtering agent for water; but I’m not sure what its topical effects are. can I fill a tooth with this? from a filling that fell out? I have no idea if you could do this in an emergency or not, but unless it is a real emergency with no hope of getting professional help, I would recommend a dentist. Do you need to add charcoal or is just the pine heated up enough for the glue? Also, is there an easy way to get it off your hands?! just pitch alone will work in a bind but the added charcoal makes a better glue. Not easy to remove from your hands in the wild. If at home you can wash hands with turpentine or paint thinner then wash immediately with hot soapy water to remove thinner or turpentine.